Security threats are very real, and the stakes are higher than ever. Each day, tens of thousands of malware variants are created, with new classes of threats continually added and improved upon. Savvy attackers use polymorphic programs to alter malware into new form factors after each delivery. And all of this is exacerbated by the proliferation of mobile devices, cloud computing and social media—in fact, the intersection of these technologies provides fertile new ground for threats and malware. Today’s attacks are often not random, but targeted for maximum financial gain and impact. Rogue individuals and groups are constantly innovating new ways to attack organizations’ most valuable assets. As a result, traditional methods of dealing with threats are no longer enough. 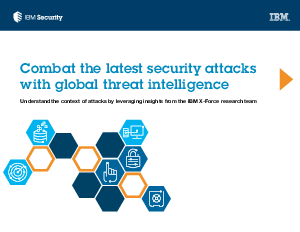 Organizations need more threat intelligence than ever before in order to effectively protect themselves.